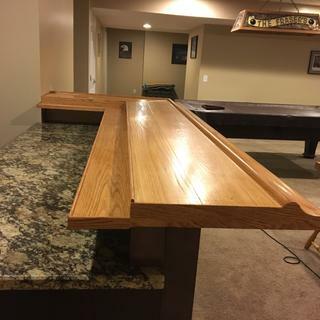 This red oak wood bar molding, also known as Chicago bar rail, gives your guests a spot for arm support. 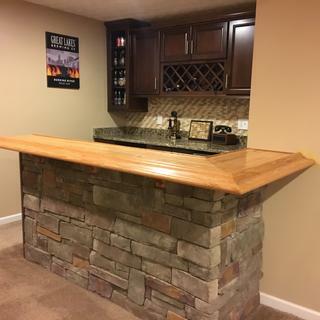 It also adds the great look of a finished perimeter around your bar. This bar arm rest is made of red oak wood, which is arguably the most popular hardwood in the United States due to its durability and distinctive swirling pattern. 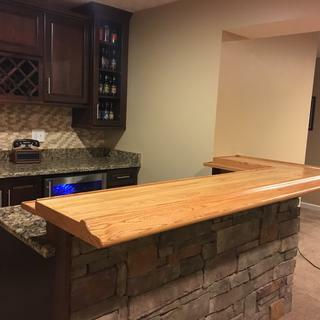 For a fully professional look, add 90-degree corners to match the curvature of your bar, or bar edge end caps to match this red oak wood color. You can also add sturdy wood bar foot rails that match the finish of this oak. The bar rail completes the overal appearance of my bar. Easy to install. It is a very good product for the cost. I would purchase it again. Molding arrived as scheduled and packaged extremely well to prevent shipping damage. The quality of the delivered molding is extremely good (flat/straight lines, no knots or voids, good color). Grain patterns between the different pieces match very well. The molding was cut, mounted, sanded and stained without issue. The finished look is great! Much better than expected and very happy with the results. Lots of compliments from visitors. There were no flaws and delivery was fast. I ordered twice from KegWorks and recieved my orders quick and exactly what I ordered. The finish on the oak is high quality and the 8ft rail is perfectly straight. Outstanding service and materials. I will order again without a doubt. My 4th residential home bar and I’ve used this product on a commercial bar. Thank you for sharing your projects! The bars look great! How to install the bar rail? 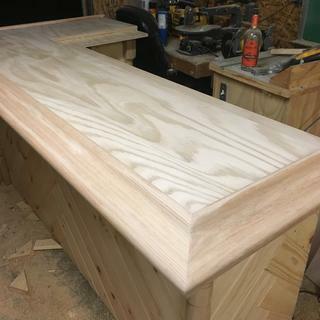 BEST ANSWER: Build your bar top to the thickness of your bar rail. Then dry fit the rail to ensure the edge of the bar matches up with the shape of the bar rail. Finally to install the rail I would lay a bead of wood glue and a fix with wood screws from underneath making sure you measure so your screws don't come through the top of the rail. I started by laminating 3 boards together that were the desired length and width. Take in to account the width of the bar rail since your top will be overlapped by it. These boards should be the same thickness as the bar rail or a little more. Then I used a router to cut the shape of the bar rail out of the edge to be I stalled on. If you don't have a router or don't want to use it then measure your boards before laminating then and cut the appropriate width to match the shape of the rail. Once you have the correct fit, put on a bead of glue and predrill and screw the rail in place from underneath making sure to not poke through the top. The top edge of the rail needs to go over the actual bar top. The rest of it will rest on your subtop (plywood under your bartop) with the rounded edge around the side of your plywood. Look at the measurement of the bar rail from the side to determine the thickness of the plywood needed. Some of this will depend on the thickness of your bar top as well. I attached it to the bartop using a pneumatic brad nailer and some wood glue. Of course dry fit everything before you nail it down. I’m looking for bar rail arm rest molding for a curved bar? BEST ANSWER: I purchased this rail earlier in the year. It is hands down the most comfortable bar rail we've ever felt. We are constantly commenting to each other at actual restaurants and bars, just how much nicer ours actually is. Probably one of the best 2018 purchases for our home. I highly recommend it! 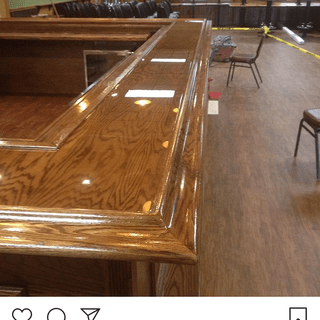 HI Paul, we offer curved molding pieces to navigate 90 degree corners but if you have a bar top with "swooping" curves we don't offer molding for that. You would have to work with a carpenter to have those custom built. I hope that helps. Cheers! I purchased the corner arm rail and it worked well on the 2 corners I built. Just make sure you do the correct measurements as there are 2 different sizes you can purchase. They have 90 degree radius molding. If the curve is other than that, it may need to be custom made . What lengths does the bar rail come in? BEST ANSWER: The current sizes are available in the products section of the website, when I ordered, they had custom lengths and standard. 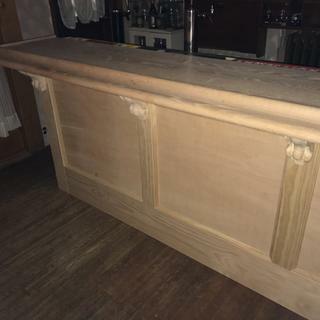 I purchased the 8 foot section for the main bar and a 4 foot section for the angled left gate section of the bar. I bought both a 4’ and an 8’ for my bar. Various lengths but 8’ max I believe. Can this be cut to a 10 ft section? BEST ANSWER: I think it only comes in 8 ft lengths. I bought 2 lengths that covered the width and entire length of my bar. Just make sure you make your angled cut somewhere in the middle of your bar (anywhere around 4-6 ft from the end) so it doesn't look too awkward. Also save enough of the scrap if you need it to cover the width of the bar in one piece. Does the arm rest come in maple ? Yes, we do carry bar arm rest molding in Hard Maple. See the link below. Cheers! Do you have a video of attaching the arm rest? BEST ANSWER: Thank you for your question. Unfortunately we do not have a video of how to install the arm rest. However our customers have provided some very detailed installation instructions in response to others questions. Please take a look there to see if that information helps. You can also call us at 877-636-3673 and speak to one of our bar rail experts who can answer your questions. Cheers! BEST ANSWER: The overall dimensions are 4 3/4" W x 2 1/2" H. Lengths are available in 2 - 8 foot increments. There is a diagram with additional measurements included with the product photos. Cheers! what is the height of the bar arm rest 8x? The height is 2.5". There are detailed images with measurements on the product page if you scroll through the images. Here's a direct link, just in case. If you have any additional questions, please don't hesitate to reach out to our bar rail experts at 877-636-3673. Cheers!